Two or so years ago after the sad passing of yet another toddler Sanitech briefed its R&D department to find a solution to the travesty of the current pit latrines. Their mandate was simple. Firstly, develop a product that protects our children from harm and the risk of falling into an open pit. Secondly, develop a product that ensures that the user has a dignified experience when using the facility. The smell and sight of the waste must be eliminated. Thirdly, make sure that there is no more direct exposure to the raw waste and the health risks associated with this. Fourthly, given that we are water scarce country make sure we protect our underground water by containing the waste as the current pit latrine system sees this waste leach into our underground water system with the resultant contamination. Towards the middle of last year, Sanitech achieved the goal set and developed their patented Khusela (DST) Dry Sanitation Toilet unit that can be retrofitted to an existing pit latrine to not only prevent children from falling in to the pits, it prevents the spread of disease, is serviceable and protects the environment from contamination. 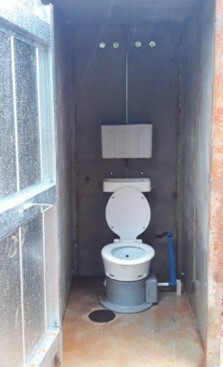 They have successfully trialled our first toilets and to-date have installed over 150 units. “The feedback from the communities has been positive” says Robert Erasmus Managing Director of Sanitech. Plain pit and bucket latrines are not allowed at schools in terms of the norms and standards document. Despite this there are still over 4 000 schools across the country that only have plain pit latrines as toilets. More than 30 schools in the Eastern Cape have no ablution facilities whatsoever. One of the immediate actions which can be implemented is the use of portable toilets, which is a vital element of disaster management. With an estimated 5 Million pit latrines in South Africa, the risk to our children remains high and we are saddened by the death last week of five-year-old Lumka Mketwa and the previous death of five-year-old Michael Komape. The time has come to urgently address the issue of poor sanitation. Sanitech’s Khusela (DST) Dry Sanitation Toilet is the solution and can be retrofitted to the current VIP pit latrines and it is an improved solution to the existing units which will cost a fraction of what a completely new solution would cost.” Says Erasmus. A rotating bowl ensures that not only is it impossible for a child to fall through but it covers the waste and prevents the smell of the waste permutating upwards into the unit. A speciality developed containment system prevents the waste from leaching into the underground water and the waste can be pumped out which ensures that the pit does not have to be rebuilt on another site when it is full. Sanitech is a leading provider of cleaning and hygiene services, operating in sub-Saharan Africa. It prides itself on being the continent’s leader in toilet hire and technology, providing superior products and excellent customer service. Sanitech is a division of Waco Africa, a Level 3 BEE contributor and is 51% Black owned.